I don't mean to complain about French dinner invitations. I am always happy to be invited to dine elsewhere. But the timing presents some challenges for this American family. For example, this Saturday, we are invited to a French person's house at 8pm. That means we will show up at 8:05 and be the first people there, possibly awkwardly so. The French will show up around 8:30 and there will be at least one guest who doesn't show up till 9pm. We will wait for them. Once the last guest shows up, the host and hostess will allow them time to have drinks and hors d'oeuvres in a relaxed manner and then, once they can extricate themselves to the kitchen to get things going, they will have us at the table around 10 for a 3-course meal that finishes around midnight (if all goes smoothly). Then we might "pass au salon" (head to the living room) for more drinks and talking. It will be a lovely night, but in order for us to make it (let alone the children, who are also invited), we will have eat a 4pm goûter so big it looks like a small meal. There will be protein involved. Recently, an American friend, married to a Frenchman and living here for more than 20 years, invites me and Anthony, along with another guest who was mostly raised in the US. She tells us to arrive around 7:30-7:45, and by 7:45, we are all there. We talk and have some drinks, then sit down to a cozy, toasty raclette dinner by 8:30. It is all très civilized, very fun, very manageable, and she jokes that she knew she could invite us "that early" because we are all American. Frankly, we hadn't even noticed the start-time was early. It seems normal, and appropriate and, had I actually thought about it, I would have even said it was a fashionably late European time to eat at 8:30. I'm such a country bumpkin. While retirees in Florida are eating their dinners at 4pm in order to get the Early Bird Special, French people are often not even having their afternoon snack yet. You might need a goûter at 5 to make it to dinner at 9, but that's OK, because you might have had lunch at 2. Restaurants often don't even open till 7:30. In Paris, restaurants often have seatings at 9:30 and even 10, though not after that. In the countryside, the last seating is usually 8:30 or 9. It's not like in Spanish-speaking countries, like Chile, where Anthony and I once tried to be hip and culturally astute by showing up for a meal at 11pm, only to discover that we were the first people in the restaurant and that it didn't start to fill up till we left around 1am. But it's also not like in the States or Anglophone countries like the US, England, and Ireland, where people -- especially with children -- regularly eat at 5:30 or 6pm (and 7pm seems to be fashionably hip). Once in a while, on a lazy weekend day, our family eats brunch at 10ish, then skips lunch and, instead of having a snack at 4, just has a big dinner at 5:30. In Paris, this is wearing our freak flag high. Once many years ago, my parents and I traveled by car from Spain into France. In Spain, we stopped in various small towns to eat dinner at 7pm, 7:30, 8, 8:30, and were told "Too early!" We crossed the border at 9pm and found are first small town shortly after. We stopped in for a meal and were told -- you see what's coming -- "Too late!" We ended up eating at a BP Oil truck stop, and my father maintains to this day that it is his favorite restaurant in all of France. When the raclette meal at our friend's house winds down around 10:30, and we are all clearly tired, we get up politely, thank our hosts, and head home. She teases us that she will not "say the dreaded phrase 'on passe au salon...' because then you know you're in for at least a couple more hours." You're not getting home till 2am, and well before that, you will be drunk and tired. I know that the kids go to bed later and wake up later here, and that everything is just slightly shifted, but it still takes some work for us to eat on the French schedule, except when we come home from gymnastics and dance classes at 8pm and can't get dinner on the table till 8:30 anyway; then we feel so very French. Raclette Vin Blanc is a hard cow cheese made from raw or pasteurized milk in various places in France. Much of it comes from Rhône-Alpes, which would be logical. But the sample I buy happens to be pasteurized and comes from a farm in the Lot et Garonne department of the Aquitaine region in southwestern France. Though not typically cow country, or raclette country for that matter, it's still a fine specimen, rubbed with white wine as it ages. It's not so much the wine that gives it the golden color as the late afternoon sunlight. But I like the golden glow and think it's appropriate for a white-wine based cheese. It's a cheese whose sole purpose in life is right there in the name: for melting and making raclette (melted cheese scraped over potatoes and meat) -- perhaps accompanied by a nice glass of white wine. In the name of honest journalism (and feeling a bit peckish), I do taste a bit of the Raclette Vin Blanc raw. It's a hard cow cheese, firm and a bit rubbery with the herbs and grasses, and the wine gives it a sort of sweet undertone. Raclette Vin Blanc cheese because when I am invited to my American friend's house for raclette, I do in fact have a nice glass of white wine, a Sancerre (my favorite white) with it. 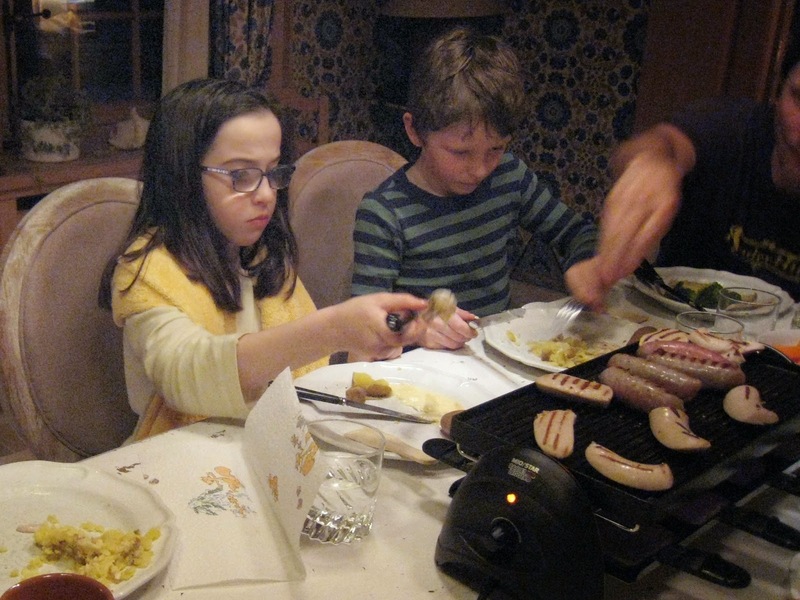 I am happy to eat raclette around 8 or 8:30pm, by the time we pass to the table from our pre-dinner apéritif, and be home and in bed around midnight.